Spring Soap Gift Set. Looking for the perfect floral soap arrangement? Look no further than our spring soap set. This wonderful 3 pack of Lilac, Lily and Rose soaps is the perfect combination and will have your home smelling elegantly like the soft winds of spring. 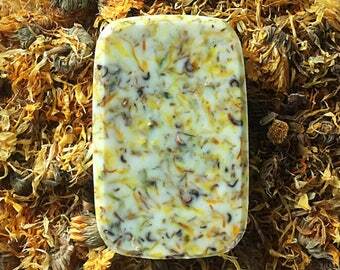 Each floral soap gift set comes with three, 4.5 ounce soap bars. 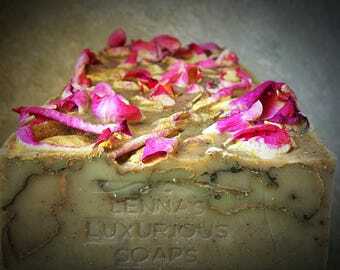 These soaps are handcrafted by yours truly with the perfect amount of fragrance to wow your guests. 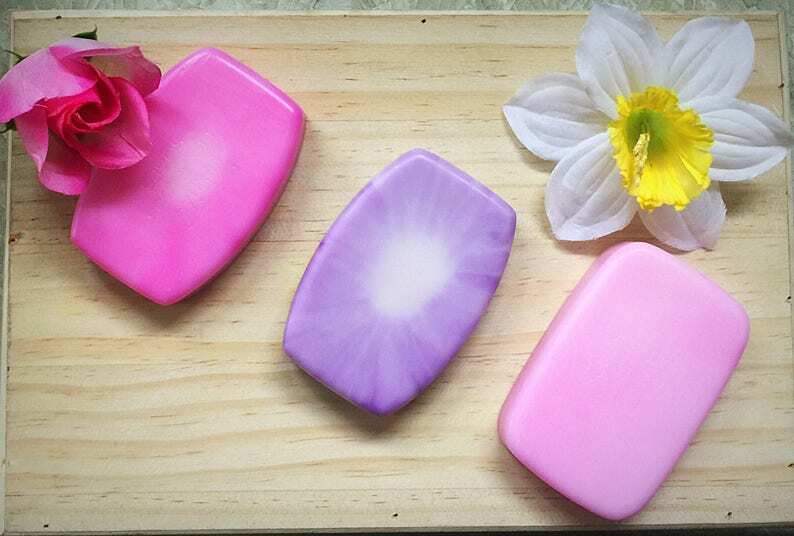 All flower scented soap packs are made with a combination of high quality goats milk soap, vegetable glycerin and the very best (Phthalate free) fragrance oil & highest quality essential oils on the market. 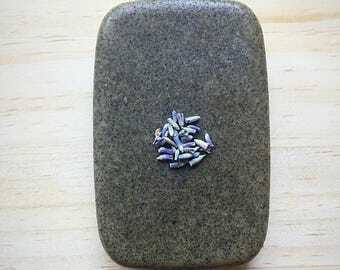 Each set comes nicely packaged when it arrives and makes the perfect spring or Easter gift. SHIPPING NOTE: In regard to final shipping estimates at checkout. If applicable, we will always refund any cost difference back to you when your product ships. I have been using this soap for almost a year, on my face and neck only. It has kept my skin soft , moist and even toned. It took about 6 weeks of using it twice a day before I saw a difference and about 2 months for others to comment on how good my skin look. You must use it consistently to see a difference but it works. No break outs and no blemishes. It also has kept my Eczema in check. 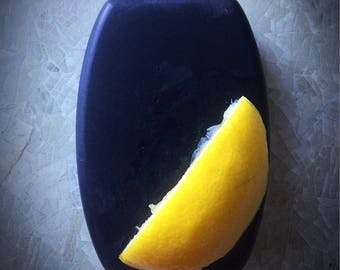 Excellent soap!! Stunningly fast shipping! Thank you so much! We will always accept customization questions, however, we may not always have the means to fulfill certain requests. Send us your questions and we will get back to you shortly. On bulk or wholesale orders, please allow 5-7 business days regardless of availability. This time frame is needed to accurately and efficiently process all of our pending orders, simultaneously. All wholesale orders are final. All of our products come as ready made gifts and will be packaged appropriately to ensure safe shipping. If you require any specialty packaging or wrapping, we will up-charge slightly above our cost to a accommodate your request. We are open to wholesale on a case-by-case basis. Please email us your questions and we will do our best to respond quickly. Quite possibly the most difficult question to answer. Since we all come in various shapes & sizes, shower & bathe for varied lengths of time, utilize soap trays and some folks simply do not. After much research, we can give you a general answer. Usually 1-3 months. 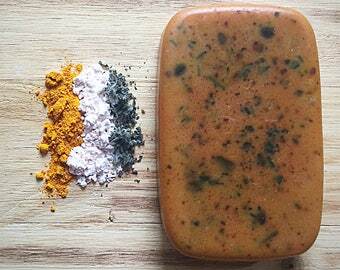 Our Loofah Soaps last 1-2 months per 4.5oz bar, 3-6 weeks per 3oz soap. Generally speaking, loofah soap bars are used a bit more vigorously. We strongly recommend utilizing soap trays to improve the longevity of each soap you purchase. Our shipping costs generally fall 5-7% below the standard USPS cost table that we are billed. If for some reason you are overcharged during checkout, we will refund the difference after we ship your product. We use USPS First Class shipping on orders less than 14oz. USPS Flat rate (2-3 day) is used for all orders over 14oz (3 standard size bars). If you require shipping upgrades such as 1 day or additional insurance, simply let us know before checkout and we will provide this add-on as an option prior to checkout. Lenna's Luxurious soaps is not responsible for stolen packages.The customer must closely track their package once we provide tracking info to avoid any possibility for theft.We especially recommend this in multi-unit dwellings. Glycerin soap is a humectant. Please be sure to keep this product in low humidity areas after each use or under 110 degrees. All of our products ship from Arizona, however, we have never encountered an issue with heat deterioration thus far. Prolonged direct sunlight however can cause color and scent loss. USPS does a great job of keeping temps optimal during sorting, processing and shipping.